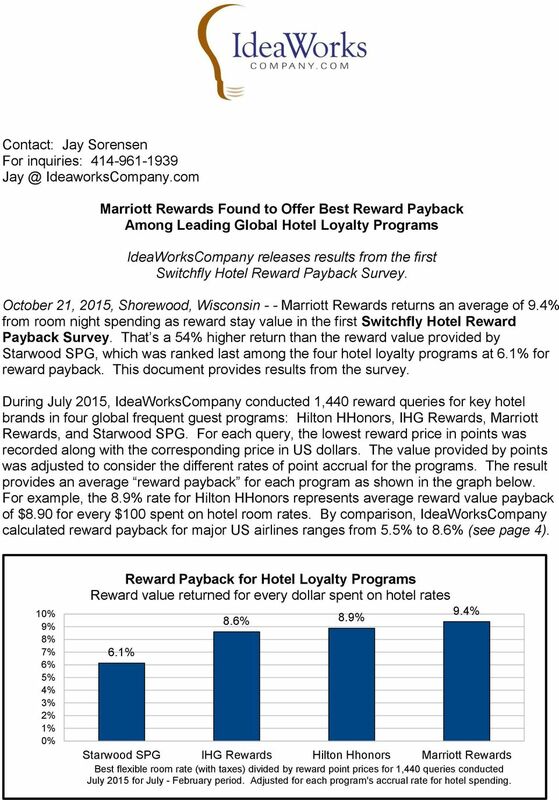 Download "Marriott Rewards Found to Offer Best Reward Payback Among Leading Global Hotel Loyalty Programs"
1 Contact: Jay Sorensen For inquiries: IdeaworksCompany.com Marriott Rewards Found to Offer Best Reward Payback Among Leading Global Hotel Loyalty Programs IdeaWorksCompany releases results from the first Switchfly Hotel Reward Payback Survey. October 21, 2015, Shorewood, Wisconsin - - Marriott Rewards returns an average of 9.4% from room night spending as reward stay value in the first Switchfly Hotel Reward Payback Survey. That s a 54% higher return than the reward value provided by Starwood SPG, which was ranked last among the four hotel loyalty programs at 6.1% for reward payback. This document provides results from the survey. During July 2015, IdeaWorksCompany conducted 1,440 reward queries for key hotel brands in four global frequent guest programs: Hilton HHonors, IHG Rewards, Marriott Rewards, and Starwood SPG. For each query, the lowest reward price in points was recorded along with the corresponding price in US dollars. The value provided by points was adjusted to consider the different rates of point accrual for the programs. The result provides an average reward payback for each program as shown in the graph below. For example, the 8.9% rate for Hilton HHonors represents average reward value payback of $8.90 for every $100 spent on hotel room rates. 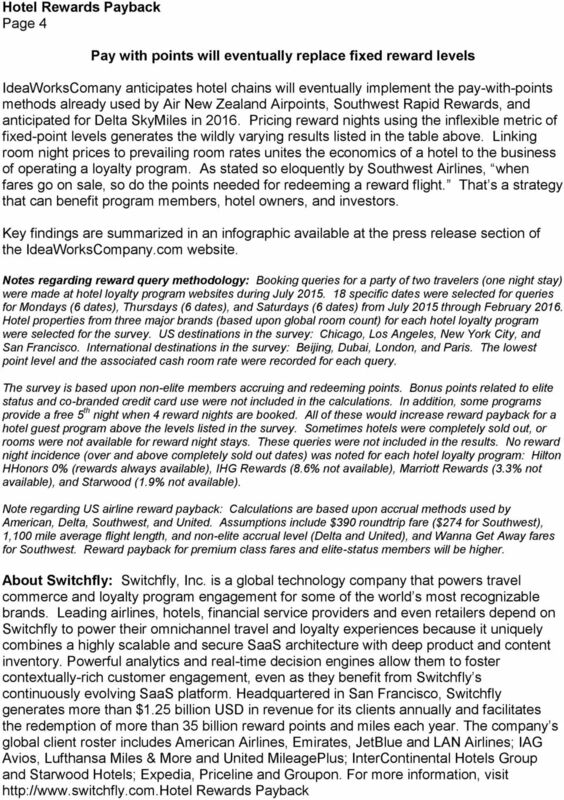 By comparison, IdeaWorksCompany calculated reward payback for major US airlines ranges from 5.5% to 8.6% (see page 4). 10% 9% 8% 7% 6% 5% 4% 3% 2% 1% 0% Reward Payback for Hotel Loyalty Programs Reward value returned for every dollar spent on hotel rates 9.4% 8.6% 8.9% 6.1% Starwood SPG IHG Rewards Hilton Hhonors Marriott Rewards Best flexible room rate (with taxes) divided by reward point prices for 1,440 queries conducted July 2015 for July - February period. Adjusted for each program's accrual rate for hotel spending. 2 Page 2 Consumers want apples-to-apples measurements from their loyalty programs to know who is being truly generous with their rewards, said Switchfly CEO Daniel Farrar. That s why we launched the Switchfly Hotel Reward Payback Survey: to determine the average reward payback for each program and see how they compare against each other. 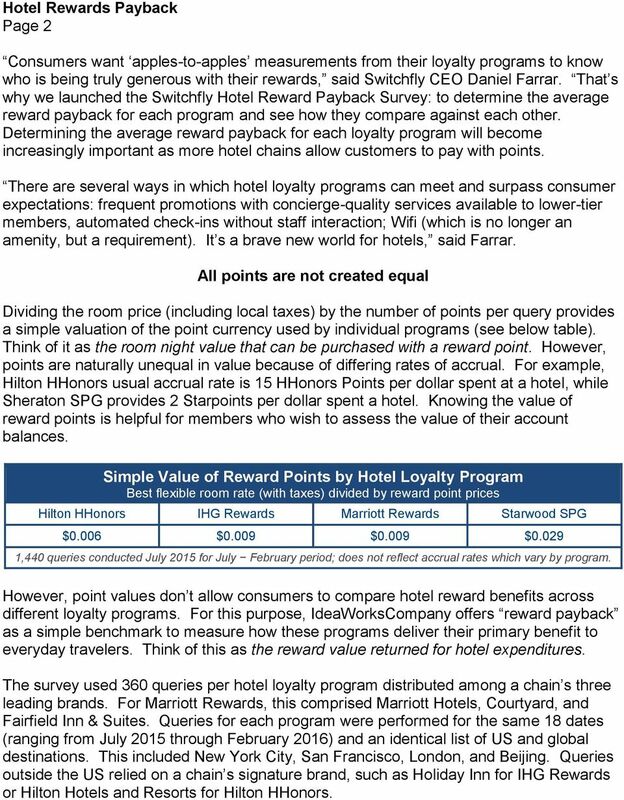 Determining the average reward payback for each loyalty program will become increasingly important as more hotel chains allow customers to pay with points. There are several ways in which hotel loyalty programs can meet and surpass consumer expectations: frequent promotions with concierge-quality services available to lower-tier members, automated check-ins without staff interaction; Wifi (which is no longer an amenity, but a requirement). It s a brave new world for hotels, said Farrar. All points are not created equal Dividing the room price (including local taxes) by the number of points per query provides a simple valuation of the point currency used by individual programs (see below table). Think of it as the room night value that can be purchased with a reward point. However, points are naturally unequal in value because of differing rates of accrual. For example, Hilton HHonors usual accrual rate is 15 HHonors Points per dollar spent at a hotel, while Sheraton SPG provides 2 Starpoints per dollar spent a hotel. Knowing the value of reward points is helpful for members who wish to assess the value of their account balances. Simple Value of Reward Points by Hotel Loyalty Program Best flexible room rate (with taxes) divided by reward point prices Hilton HHonors IHG Rewards Marriott Rewards Starwood SPG $0.006 $0.009 $0.009 $ ,440 queries conducted July 2015 for July February period; does not reflect accrual rates which vary by program. However, point values don t allow consumers to compare hotel reward benefits across different loyalty programs. For this purpose, IdeaWorksCompany offers reward payback as a simple benchmark to measure how these programs deliver their primary benefit to everyday travelers. Think of this as the reward value returned for hotel expenditures. The survey used 360 queries per hotel loyalty program distributed among a chain s three leading brands. For Marriott Rewards, this comprised Marriott Hotels, Courtyard, and Fairfield Inn & Suites. Queries for each program were performed for the same 18 dates (ranging from July 2015 through February 2016) and an identical list of US and global destinations. This included New York City, San Francisco, London, and Beijing. Queries outside the US relied on a chain s signature brand, such as Holiday Inn for IHG Rewards or Hilton Hotels and Resorts for Hilton HHonors. 3 Page 3 Most hotel loyalty members do not hold the program s co-branded credit card and don t have elite status. For these members, the reward payback method provides a good measure of reward value. Members that have elite status and use a program s cobranded credit card to pay room charges benefit from a dizzying array of bonus point possibilities. These members might consider doing their own calculations based upon the simple value of reward points presented in the table above. The value provided by reward nights is traditionally the most important attribute for many members; the results presented in the survey don t attempt to assess all the benefits provided by hotel loyalty programs. 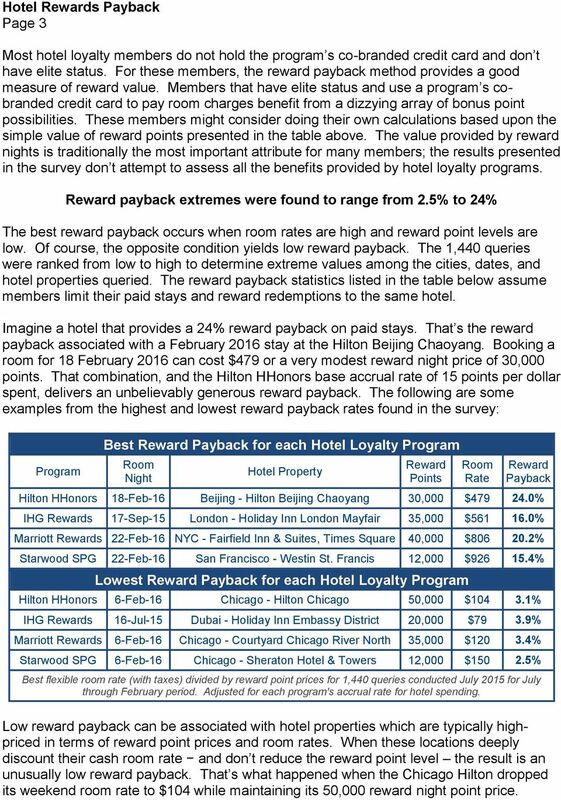 Reward payback extremes were found to range from 2.5% to 24% The best reward payback occurs when room rates are high and reward point levels are low. Of course, the opposite condition yields low reward payback. The 1,440 queries were ranked from low to high to determine extreme values among the cities, dates, and hotel properties queried. The reward payback statistics listed in the table below assume members limit their paid stays and reward redemptions to the same hotel. Imagine a hotel that provides a 24% reward payback on paid stays. That s the reward payback associated with a February 2016 stay at the Hilton Beijing Chaoyang. Booking a room for 18 February 2016 can cost $479 or a very modest reward night price of 30,000 points. That combination, and the Hilton HHonors base accrual rate of 15 points per dollar spent, delivers an unbelievably generous reward payback. The following are some examples from the highest and lowest reward payback rates found in the survey: Program Best Reward Payback for each Hotel Loyalty Program Room Night Hotel Property Reward Points Room Rate Reward Payback Hilton HHonors 18-Feb-16 Beijing - Hilton Beijing Chaoyang 30,000 $ % IHG Rewards 17-Sep-15 London - Holiday Inn London Mayfair 35,000 $ % Marriott Rewards 22-Feb-16 NYC - Fairfield Inn & Suites, Times Square 40,000 $ % Starwood SPG 22-Feb-16 San Francisco - Westin St. Francis 12,000 $ % Lowest Reward Payback for each Hotel Loyalty Program Hilton HHonors 6-Feb-16 Chicago - Hilton Chicago 50,000 $ % IHG Rewards 16-Jul-15 Dubai - Holiday Inn Embassy District 20,000 $79 3.9% Marriott Rewards 6-Feb-16 Chicago - Courtyard Chicago River North 35,000 $ % Starwood SPG 6-Feb-16 Chicago - Sheraton Hotel & Towers 12,000 $ % Best flexible room rate (with taxes) divided by reward point prices for 1,440 queries conducted July 2015 for July through February period. Adjusted for each program's accrual rate for hotel spending. Low reward payback can be associated with hotel properties which are typically highpriced in terms of reward point prices and room rates. When these locations deeply discount their cash room rate and don t reduce the reward point level the result is an unusually low reward payback. That s what happened when the Chicago Hilton dropped its weekend room rate to $104 while maintaining its 50,000 reward night point price. Firm Profile. Founded in 1979 with core principles of Quality, Service, Flexibility and Integrity. 2015 NerdWallet Consumer Credit Card Report Published September 2015 Data compiled from proprietary NerdWallet data, consumer survey results and reports from various unaffiliated companies or agencies. HOTEL LOYALTY PROGRAMMES What works and what doesn t? White Paper. Reinforcing the value of frequent flyer miles. How non-flight rewards drive mileage currency and frequent flyer program value. Loyalty by the Billions IdeaWorks analyzes how frequent flier programs pour cash into airline coffers. General Hotels Corporation. Delivering Comprehensive Hotel Management For Over Fifty Years. Widening the Net: Co-Brand Credit Card A Written by David Morris 1 We Help You Find the Business Intelligence You Need We provide market research based solutions tailored to your specific business goals.